Observers in the villages of Mde and Mkazi, on the W flank of Karthala, reported increased incandescence from the summit during the night of 9-10 May. Our last report on activity at Karthala, located in the Comoros Islands, covered elevated seismicity and a subsequent eruption in January 2007 (BGVN 32:01). The volcano was then quiet until May 2012. 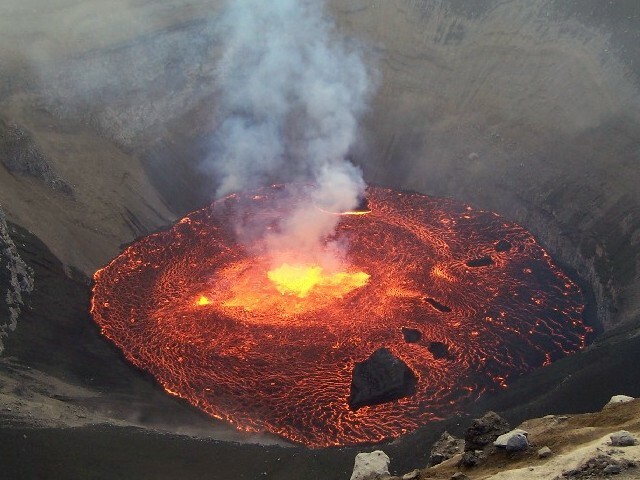 U.S. Embassy Comoros Officer, Michael Zorick informed us that residents on Karthala's W flank, in the villages of Mde and Mkazi (each ~12 km from the summit), reported observing intensified red glow toward the volcano summit during the night of 9-10 May 2012. He further indicated that there was no perceptible seismic activity. A search for thermal alerts on the MODVOLC website revealed an absence of alerts after those associated with the 2007 eruption. Information Contacts: Michael P. Zorick, Comoros Officer, Embassy of the United States of America, Antananarivo, Madagascar; and Hawai'i Institute of Geophysics and Planetology (HIGP), MODVOLC Thermal Alerts System, School of Ocean and Earth Science and Technology (SOEST), Univ. of Hawai'i, 2525 Correa Road, Honolulu, HI 96822, USA (URL: http://modis.higp.hawaii.edu/). According to news articles, scientists from the Karthala Volcano Observatory reported that an eruption occurred at Karthala during the evening of 12 January. Residents reported incandescence at the summit and strong fumes. Several strong tremors and earthquakes occasionally larger than M 4 were registered on 13 January. A lava lake that formed in the volcano's crater was seen during aerial observations on 15 January. According to news articles, eruptive activity at Karthala that occurred on 28 May had ceased. No seismic activity was detected during 31 May to 1 June. According to the Toulouse VAAC, the Meteorology Office and Observatory of Comores reported an eruption of Karthala of gas and steam on 28 May at about 2105. During 28-29 May from 2300 to 0930, a thin sulfur-dioxide plume extending 60 km NW was visible on satellite imagery. On 29 May, at about 0830, volcanologists flew above the crater and confirmed that only steam and sulfur dioxide had been emitted. According to a news article, a lava lake fed by a central fountain was also observed. According to news reports, a phreatomagmatic eruption occurred at Karthala during the evening of 24 November. Ash fell in several towns, including in the capital city Morini along the Grand Comore island's SW coast and on the volcano's W flank. According to a UN OCHA report, local authorities estimated that about 2,000 people temporarily fled their villages in the region of Bamboa in the central part of Grand Comore Island, and sought refuge in less exposed areas, such as Mitsamiouli, Mboudé, and Oichili. During the evacuation, an infant died due to respiratory distress. Ashfall caused the closure of shops and schools in Moroni and security forces cleaned the streets using water tankers. Residents were warned to avoid inhaling ash. Preliminary assessments revealed that about 118,000 people living in 75 villages may have been affected by the contamination of domestic water tanks. This is of particular concern because it is the height of the dry season. A UN worker reported that 245,000 people live in the area exposed to ash and estimated that 175,000 could face water shortages. There were also concerns about the impact of ash on agriculture and livestock. The Toulouse VAAC reported that ash from the early phase of the eruption was not immediately seen on satellite imagery, but that ash fell at the local airport. AFWA reported that the ash cloud was visible on satellite imagery on 25 November at a height of ~11.6 km (~38,000 ft) a.s.l. According to the Karthala Volcano Observatory, a lava lake formed in the volcano's crater. As of 29 November, seismic activity continued at the volcano. According to news articles, eruptive activity at Karthala beginning on 17 April consisted of heightened seismicity, and gas and ash emissions. Hundreds of villagers who lived near the volcano evacuated. Flights to the island were cancelled. 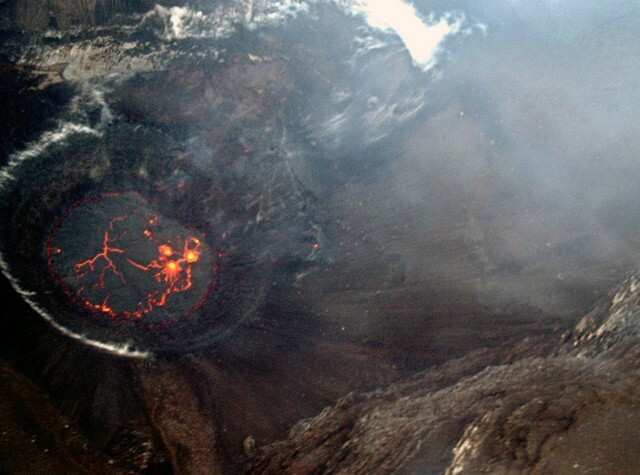 Scientists found that lava was confined to the bottom of the summit crater. Activity subsided around 19 April, with ash emissions ceasing. On the 19th, residents began to return to their homes and flights to the island resumed. Prior to the activity, scientists at the Mount Karthala Observatory reportedly recorded a "seismic crisis" on 24 March, consisting of 40 small earthquakes in comparison to the normal 15 earthquakes per day. Reports of a stream of lava flowing from Karthala towards towns on 30 August were false. Authorities stated that only fume was emitted from cracks on the volcano. According to news reports, Observatoire Volcanologique du Karthala scientists noted a steady increase in seismicity at Karthala over the past 3 months. Around 100 earthquakes occurred per day in August in comparison to 1-2 per day in June. The following cable was received on 21 September 1972. "Karthala . . . started new eruption 8 September 1972. Rapidly built up cinder cone at northern end caldera close to Porte D'Itsandra. Still quite active with boiling lava lake. Early flows emitted about 2,300 m above sea level rapidly reached altitude 1,500 m and stopped. Further yet narrower flows presently running over early ones. No immediate danger foreseeable for either capital city of Moroni or airfields." An effusive eruption was reported on 6 April. About 4,000 people were evacuated from the path of the lava, which was flowing towards the sea. No deaths have occurred. Information Contacts: G. Beauchamp, OFDA. The eruption began at about noon on 5 April from a SW flank vent, after a series of local tremors during the morning. Basaltic lava was extruded, which divided into two flows ~300 m wide and 3-15 m thick, separated by several hundred meters. The flows reconverged downslope and reached the sea on 6 April. Strong earthquakes were felt on the SE flank on 8 April, but were not accompanied by surface activity. Lava extrusion had ended on 10 April, although heavy fuming from nearby fissures continued as late as 17 April, preventing close approach to the vent, which was surrounded by up to 6 m of lapilli. No casualties were reported, but 4,000 people were evacuated and three villages damaged or destroyed. Further Reference. Krafft, M., 1982, L'Eruption volcanique du Kartala en Avril 1977 (Grande Comore, Ocean Indien): C.R. Acad. Sci. Paris, serie II, v. 294, p. 753-758. Information Contacts: P. de Saint Ours, St. Maurice, France; G. Beauchamp, OFDA. Widely distributed news reports of ash and lava emission during the evening of 2 July proved incorrect. As of mid-July, the only documented eruptive activity had been a phreatic explosion on the 11th. According to the press, some villages around the base of the volcano were evacuated, but many fewer residents fled than the tens of thousands initially reported [see 16:8]. The eruption followed three months of increasing seismicity monitored by a joint group from the Centre National de Documentation et de Recherche Scientifique des Comores (CNDRS), the Univ de la Réunion, and the IPGP. The following is from their report. [See 16:8 for additional details]. An average of 3-5 seismic events/month were recorded from the start of monitoring in June 1988 until April 1991. "At the beginning of April, a slight increase in seismicity was noticed, with events mainly centered under the summit caldera from 0-2 km below sea level [see also 16:8]. The rate of seismicity progressively increased from an average of 5-10 events/day in May to 20/day in June, reaching 40/day by the end of June. The earthquakes occurred along a roughly N-S axis below the summit caldera at 0-1 km below sea level. Deformation measurements, using a 10-station dry-tilt network in the summit caldera, indicated inflation of ~ 20 µrads. "At 1645 on 30 June a seismic crisis began with events centered below the S part of the caldera and the volcano's S flank. During the night of 30 June, many shocks were felt by residents of the SW part of the island. Seismic activity continued 1-2 July, with both short- and long-period events occurring at average rates of 60-100/hour. Some of the short-period events reached M 2.5-3. One M 3.1 earthquake (at 0708 on 2 July) was felt in the SE part of the island (in the Foumbouni area; figure 1). This intense seismic activity has caused many people living in the SW to move to Moroni, the capital and island's largest city. Figure 1. Topographic map of Karthala, after Strong and Jacquot (1970). "The seismic crisis continued until 10 July, with the number of earthquakes reaching 250/hour. After several hours of relative calm, a phreatic eruption occurred at 0330 on 11 July [but see 16:8], after which the number of earthquakes returned to ~100/hour. During overflights of Choungou Chahalé Crater (summit area), it was observed that the rim of the S half of the summit caldera was covered by ash and blocks of old material. The crater was filled with gas that stagnated in its bottom. A sound like a lava fountain [but see 16:8] was audible, but no lava fountain was visible. The same day, seismometers recorded ~40-60 earthquakes/hour, most of M <2. Some of M >3 were felt by the population." Reference. Strong, D.F., and Jacquot, C., 1970, The Karthala Caldera, Grande Comore: BV, v. 34, p. 663-680. Information Contacts: P. Bachélery, Univ de la Réunion; J-L. Klein, CNDRS, RFI des Comores; J-L. Cheminée, IPGP; UPI; AP; Reuters. The bottom of the summit's Choungou-Chahalé crater, obscured by a cloud of white gas and vapor following the 11 July phreatic eruption, became visible in early August. A new explosion crater (~250 m in diameter) was observed in its SE section. Vigorous degassing occurred through the crater lake and from the wall of the new crater. The following, from Patrick Bachélery, supplements the report in 16:6. Karthala's 11 July explosion followed an increase in seismicity from 3-5 events/month (June 1988 start of monitoring through early April 1991) to 3-10 events/day in May (figure 2). Earthquakes were centered beneath the crater, mostly at 0-2 km below sea level, with a few 10-20 km below sea level. On 4 May, a swarm of 161 earthquakes (M 0.5-2) was recorded during a 1-hour period beginning at 1609. The number of earthquakes increased to 30-50/day by the end of June, and all were at shallow depths. Deformation measurements showed summit inflation of ~20 µrad during this time; only weak changes in deformation had been measured between the network's installation (May 1987) and June 1989. Figure 2. Daily number of earthquakes at Karthala, March-June (inset) and May-July 1991. Courtesy of P. Bachélery. A notable change in seismicity occurred on 30 June at 1645. More than 500 earthquakes (long- and short-period) were recorded that day, as many on the next, and >1,500 daily 2-4 July (figure 2). The short-period events (M 0.5-3.1) were centered in a roughly N-S line below the S part of the summit caldera and the S flank of the volcano (figure 3). Felt shocks caused ~1,000 people to leave the lower part of the S flank. Figure 3. Epicenter map of short-period earthquakes at Karthala during 30 June-4 July (open squares) and 5-10 July 1991 (filled squares). Courtesy of P. Bachélery. Seismicity continued to increase from 4 July, with 4,000 earthquakes recorded daily by 10 July. A swarm of nearly continuous seismic events was recorded between 0040 and 0110 the next day. The 4-10 July seismicity was characterized by low-magnitude (mostly M <1, sometimes to M 3.4) short-period events located under the summit at 1-4 km depths, and less numerous deeper earthquakes at 4-8 km depth. Some long-period events with cigar-shaped waveform envelopes were also recorded. The center of seismicity shifted N, resulting in fewer felt shocks in the S part of the island, while several M 3 earthquakes were felt in Moroni (13 km NW of the crater). Deformation measurements (dry-tilt) the morning of 10 July showed >120 µrad of inflation centered on Choungou-Chahalé and Choungou-Chagnoumeni (figure 4) craters since 28 June. That night, the eruption took place, but no eyewitness accounts are available. Seismicity reached its highest intensity during an 11-hour period that night [but see 16:6], dropping abruptly at 0335 on 11 July to ~100 recorded events/hour. About 1.5 hours later, a strong sulfur odor was detected in Moroni for ~2 hours. Figure 4. Map showing Karthala's summit region and deposits from the 11 July 1991 explosion. Courtesy of P. Bachélery. Later visits to the summit revealed that a sizeable phreatic explosion had occurred in Choungou-Chahalé crater. The southern 2/3 of the summit caldera were covered by blocks (up to 10 m3) and ash (figure 4), and the summit vegetation was completely removed from within the limits of the caldera. The crater bottom was hidden by gas and vapor clouds, obscuring the source of a "fountaining" sound heard two weeks after the 11 July explosion. Geologists later believed the sound to have been caused by the forceful arrival of water into the new crater, forming the crater lake. Seismicity rapidly decreased after the explosion, although several earthquakes of M 3.0-3.5 were recorded through the end of July. In August, 20-40 events/day were recorded, the same level as in June. Information Contacts: P. Bachélery, Univ de la Réunion; D. Ben Ali and J-L. Klein, CNDRS, RFI des Comores; F. Desgrolard, Centre de Recherche Volcanologique, Clermont-Ferrand, France; J-L. Cheminée, J-P. Toutain, and J-C. Delmond, IPGP. Since July 2003, Karthala has exhibited significant, but relatively shallow, seismicity. As of 28 August, P. Bachelery of the University of La Réunion reported that an average of 100 seismic events/day were being recorded, some felt by the local population. The first seismic station was installed at the Karthala Volcanological Observatory in 1988 by the University of La Réunion and the Institut de Physique du Globe de Paris (IPGP). During the summer and fall of 2000 increased seismicity was reported, and an earthquake swarm was recorded in October 2000 (BGVN 25:10). In April 1991, a notable increase in the number of seismic events began and, after about three months of seismic activity, there was an eruption in July (BGVN 16:06 and 16:08). Information Contacts: Patrick Bachelery, Laboratoire des Sciences de la Terre, Université de La Réunion BP 7151, 15 Avenue, René Cassin, 97715 Saint-Denis (URL: http://volcano.ipgp.jussieu.fr/karthala/stationkar.html). After a long period of quiescence following the 1991 phreatic eruption, Karthala's seismicity rebounded starting in July 2000 (BGVN 25:10). In October 2000, more than 20 seismic events per day were recorded. The local observatory and a key source for this report is the Karthala Volcano Observatory (KVO; Netter and Cheminée, 1997). They maintain close ties with the Centre National de Documentation et de Recherche Scientifique des Comores (CNDRS), Reunion Island University, the Institut de Physique du Globe de Paris, Piton de la Fournaise Volcanological Observatory, and various universities in France. Activity during October 2000-March 2004. Between October 2000 and January 2003, relatively low seismicity was detected beneath Karthala's summit. The seismicity slowly increased. During January instruments recorded 51 earthquakes on the 5th, 58 on the 10th, and 50 on the 11th. During the month of April 2003 instruments registered 732 (i.e. averaging ~ 24 each day). Figure 6. Karthala's ~ 300-m-diameter Chahalé crater as seen on 15 August 2003, more than a year prior to the April 2005 eruption. The photo was shot by the automatic camera located at the summit, looking from the NNE towards the SSW. The 2005 eruption dramatically changed this scene, replacing the green lake seen here with a lava lake, and blanketing considerable areas with tephra. Courtesy of Nicolas Villenueve. During the time interval from early June 2003 to January 2004 instruments registered three periods with elevated seismicity. The first interval spanned 121 days from June until the end of September 2003 and included 6,315 earthquakes. Within that interval there was a major crisis on 6th September, comprised of 345 events, some being felt by local residents (BGVN 28:08). The second interval began on 11 October 2003, reaching its peak on 4 January 2004 (253 events) and stopped on 31 January 2004. During this interval of 113 days, instruments registered 4,431 earthquakes. The third interval, during the time period of 3 February to 5 March 2004, contained fewer earthquakes. Instruments recorded 832 events in 31 days with a maximum of 143 events per day. After the third interval, KVO recorded only low seismicity until early 2005, when daily events rose to 50-60. Eruption during April 2005. A seismic crisis began at 0812 on 16 April. Although instruments initially received only short-period events, starting at 0914 they also registered many long-period ones. From 1055 on 16 April a continuous signal was recorded, which was interpreted as tremor marking the beginning of the eruption. At around 1400 that day inhabitants heard a rumbling coming from the volcano. A few minutes later they observed an ash column above the summit. The first ash-fall deposits began to form around 1600, developing on the island's eastern side. According to the firsts reports, ash deposition increased and continued through the night accompanied by a strong smell of sulfur. On the morning of 17 April ash falls continued on the eastern part of the island and were heavy enough to require inhabitants to use umbrellas to get about. At midday, Jean-Marc Heintz, a pilot for Comores Aviation, flew over the west flank and observed a large plume in the direction of the Chahalé crater. He also clearly observed airborne molten ejecta. Around 1300, observers saw a very dark plume, spreading into a mushroom shape and accompanied by lightning flashes. Some inhabitants panicked and fled the island's eastern villages. In the afternoon, residents heard rumbling. During the evening, significant rainfall generated small mudflows, and the rumbling became stronger. At that time, authorities evacuated some eastern villages (according to Agence France Presse (AFP) this affected ~ 10,000 people). Ash there started to fall on the island's western and northern parts, notably, on the country's capital city of Moroni (~ 10 km NW of the summit) and on the Hahaya airport (~ 20 km N of Moroni, ~ 25 km NW of the summit). 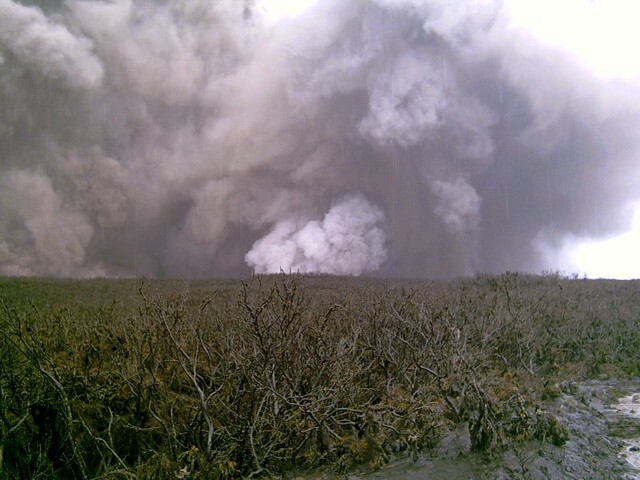 Figure 7 shows a photo with the base of a vigorous plume over the E flanks on the afternoon of 17 April. Figure 7. A phreatic eruption as seen from Karthala's eastern slopes on the afternoon of 17 April 2005. The vent lies below the white-colored zone in the center-right portion of the photo. With enlargement, many parts of the image record the descent of large pieces of ejecta. Photo credit to school teacher Daniel Hoffschir. KVO authorities sometimes witnessed a red color at the plume's base, interpreted as a sign of an ongoing magmatic eruption. At 2105 the KVO seismic network recorded a drastic decrease in the amplitude of the tremor. During the night of 17-18 April, wide variations of the tremor amplitude were recorded with a maximum at 0140 on 18 April and a minimum at 0430 on 18 April. Thereafter, the tremor amplitude did not increase. During the night of 17-18 April the plume and falling ash disappeared. On an overflight of the Chahalé crater at 0830 on 18 April, KVO personnel observed major modifications at the summit (figures 8-10). A lava lake (figure 8) had replaced the water-bearing lake (figure 6) that had occupied the crater since 1991. Figure 8. On 18 April 2005 the Karthala eruption generated a lava lake in the Chahalé crater. In this photo, taken the morning of 18 April, considerable portions of the lava lake's surface still remained molten and incandescent.. The lake's surface only remained molten for a few hours. This aerial photo was taken looking from the N. Courtesy of Hamid Soulé. Figure 9. A 19 April 2005 aerial photograph of Karthala taken from the SE centered on Chahalé crater. The lava lake's surface had chilled and it emitted white vapor. Much of the summit area displays the recently deposited smooth-surfaced tephra blanket. Courtesy of Nicolas Villenueve. Figure 10. Tephra deposits left by Karthala's mid-April 2005 eruption altered the landscape and destroyed vegetation. This picture was taken at the entrance to the first caldera on the western trail, viewed looking to the S. Courtesy of Nicolas Villenueve. On 19 April a new overflight revealed the crater floor containing the lava lake, with its chilled surface emitting steam (figure 13). Lava remained confined to Chahalé crater. Around the caldera area, and particularly on its N, observers saw conspicuous tephra deposits; most of the vegetation had been destroyed (figure 14). On 20 April a field excursion found that ash deposits varied in thickness from a few millimeters on the coast to ~ 1.5 m at the summit. Near the summit the observers recognized some post-eruptive evaporation and geothermal processes. Specifically, although the lava lake's surface had frozen, there remained sufficient heat under the surface that groundwater migrating towards to the crater's floor evaporated into steam. During another field survey on 8 May, observers noted the renewed presence of lake water inside the crater. Reference. Netter, C., and Cheminée, J. (eds. ), 1997, Directory of Volcano Observatories, 1996-1997: World Organization of Volcano Observatories (WOVO), WOVO/IAVCEI/UNESCO, Paris, 268 p.
Information Contacts: Nicolas Villeneuve (CREGUR, Centre de Recherches et d'Etudes en Géographie de l'Université de la Réunion); Hamidou Nassor, and Patrick Bachèlery (LSTUR, Laboratoire des Sciences de la Terre), Université de La Réunion BP 7151, 15 Avenue, René Cassin, 97715 Saint-Denis, Reunion Island; François Sauvestre and Hamid Soulé, CNDRS, BP 169, Moroni, République Fédérale Islamique des Comores (URL: http://volcano.ipgp.jussieu.fr/karthala/stationkar.html). The last eruption at Karthala occurred in April 2005 (BGVN 30:04); this report discusses the second large eruption of the year, on 24-25 November 2005. Karthala is a volcano with a lava lake and well-known for episodic outbursts. This report begins with imagery and maps, discusses satellite images of the 24-25 November ash plume, and then summarizes press and United Nations reports. Satellite imagery. Elements of Karthala geography appear in figure 11. This and many other figures were produced by a United Nations consortium of public and private organizations, UNOSAT, which provides satellite imagery and geographic information to the humanitarian community. The islands capital, Moroni, lies on the coast directly W of the summit complex. Figure 11. A shaded relief map portrays the island of Grand Comore, with Karthala's summit complex (the cratered, highest-elevation area) on the S. Courtesy of UNOSAT and their partner organizations. Perspective on the eruption's impact can be seen on figure 12, containing images from both pre- and post-eruption time frames (13 July 2004 and 5 December 2005). Conspicuous new deposits at distance from the summit area were imaged on 5 December. Some new deposits resided in what appear as channels to the N of the craters, suggesting that freshly deposited tephra may have entered and followed the drainage systems: see channels on figure 12, heading NE. These tentative inferences by Bulletin editors were not discussed in available ground-based reports, so confirmation is lacking. No reports were yet available discussing the morphology or potential hazards of these new deposits. Figure 12. Karthala portrayed in two images (both with 10-m resolution; bands 321 + IR (RGBI)). Both images are at nearly, though not exactly, the same scales. 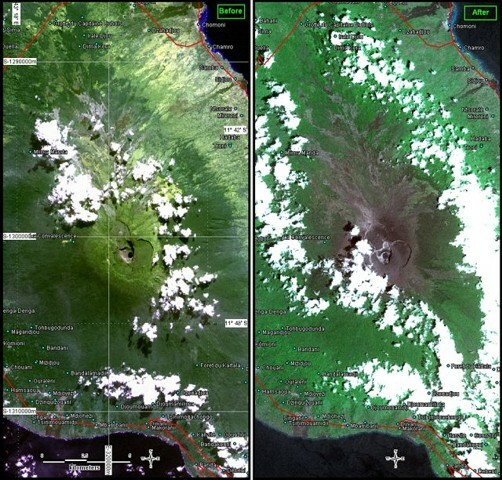 The image at left is from before the eruption; taken by SPOT4 on 13 July 2004. The image at right is from after the eruption; taken by SPOT5 on 5 December 2005. Both images are partly masked by weather clouds. Large, clearly visible areas of new deposits appear in and around the summit crater area. Courtesy of UNOSAT and partner organizations. Ash clouds. Charles Holliday (US Air Force Weather Agency, AFWA) assessed the 25 November 2005 Karthala eruption plume using a NASA Terra MODIS image at 1010 local time (0710 UTC; figure 13). He measured the overall E-W extent of eruptive clouds as ~ 150 nautical miles (~ 280 km). The W margin of the brown clouds lie up to 30-50 km W and NW of the volcano. 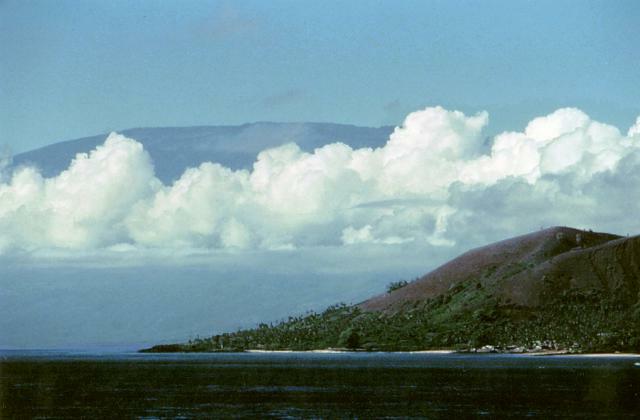 The light-colored clouds were blown SE, and they became far less optically dense towards the E where they extended over the vicinity of reef-fringed Mayotte Island. The image shows light-colored (nearly white) clouds above and centered SE of the visible brown clouds. Holliday interpreted this to represent a brown zone composed of dominantly ash with a higher lighter-colored zone of ash and ice particles. The tallest clouds reached FL 380 ('Flight Level 380,' a height of 38,000 feet or ~ 11.6 km altitude). Figure 13. An image of the Karthala 25 November 2005 ash plume from NASA Terra MODIS. The image was centered over the Comoros islands, with the islands Mayotte, Anjouan, and Moheli labeled, and Grand Comore under ash clouds but the location of Karthala is indicated. For scale, the distance from Karthala to the S end of Mayotte island is ~240 km. The image shows AFWA interpretations of the ash cloud. Courtesy of Charles Holliday (AFWA). Fred Prata (CSIRO) processed both MODIS and AIRS images for the 25 November eruption (figures 14 and 15). Both instruments are part of NASA's Earth Observing System: MODIS stands for Moderate Resolution Imaging Spectro-Radiometer (flying onboard the Terra (EOS AM-1) satellite); AIRS stands for Atmospheric Infrared Sounder (which uses a grating spectrometer on the Aqua satellite). Figure 14. MODIS satellite images of the Karthala eruption plume on 25 November 2005 at 0710 UTC. The top image maps the computed atmospheric mass loading associated with the ash cloud; inset portrays the ash grain-size estimates in the same cloud. The bottom image maps the SO2 burden in the cloud, contoured in Dobson Units; the total mass of SO2 on this image was 2.85 kilotons. For distance scales, 1° of latitude (distance N-S) equates to ~111 km. Courtesy of Fred Prata, CSIRO. Figure 15. An AIRS image of the Karthala eruption's SO2 content for 25 November at about 2223 UTC. The measured mass total for SO2 was ~2.0 kilotons. Courtesy of Fred Prata, CSIRO. Prata used the MODIS image to estimate the 25 November eruption's mass loading. This resulted in an estimate of fine ash amounting to 83 kilotons (kt) in the grain-size ranges indicated. Analysis of SO2 from the MODIS data for 0710 on the 25th yielded 2.85 kt. Prata also downloaded and processed the AIRS data available from 25 November but found only one good image (figure 12). Prata commented that the reason for the shortage of AIRS data stems from a compromise in instrument design, whereby when acquiring images at low latitudes, polar-orbiting satellites frequently lack sufficient overlap in their scanners to obtain full coverage. The one available satisfactory AIRS image, ~ 13 hours later than the MODIS image, showed a different plume configuration that included two separate zones of SO2 concentration rather than one. The mass of the SO2 measured by the AIRS instrument for the 25th was 2.0 kilotons. This value about the same as Prata obtained in a MODIS retrieval for the same 25 November eruption. In addition, the zones of elevated concentrations on both images stood in roughly the same place—except for the blob near 11°S detected by AIRS and not by MODIS. Regarding his analysis of the 25 November Karthala eruption, Prata goes on to say that "assuming my fine ash loading of 83 kt is right and (big assumption now) this represents ~ 1% of the total erupted mass, then the volume of erupted ash would be ~ 0.006 km3. This suggests a VEI ~ 2. If the 1% estimate is robust (I've seen this quoted in Bill Rose's work) then the fine ash estimates from remote sensing may be quite helpful [in] assessing the 'size' of an eruption. Coupled with cloud-height estimates we may be moving towards some nice tools for volcanologists." Prata further commented that he had hoped to image an algal bloom in the ocean where the Karthala ash had fallen. Recent work on ocean chemistry and biology (Boyd and others, 2000) point to iron enrichment as a means of ocean fertilization. 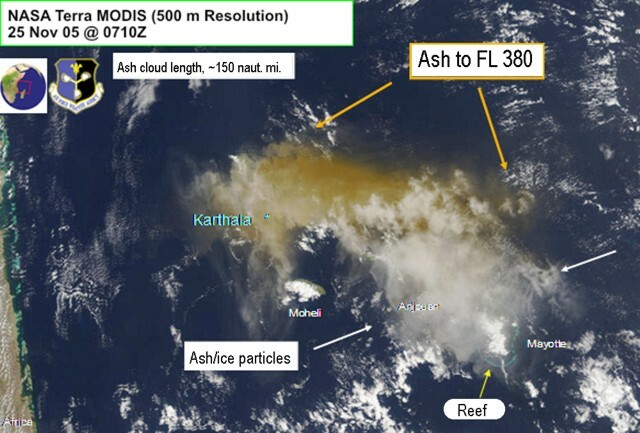 As briefly discussed on the NASA Earth Observatory website, Anatahan plumes had recently been suggested to have triggered such blooms; however, with available remote-sensing data Prata was unable to confirm that the Karthala eruption triggered such a plume. UN and related reports. The following appeared in a 28 November 2005 report of the United Nations Office for the Coordination of Humanitarian Affairs. "The Karthala Volcano forms most of the landmass of Grande Comore (also called Ngazidja), the main island of the Union of the Comoros. The volcano is one of the largest volcanoes in activity in the world. Over the last two hundred years, it has erupted every eleven years on average. In April 2005, a volcanic eruption projected ashes and volcanic debris on the eastern part of the island, affecting as many as 40,000 people. "[Karthala] had an eruption for the second time this year in the night of . . . 24 November, spilling ashes and smoke over the southeastern and southwestern parts of Grande Comore Island, and the Comoros capital, Moroni. "During Friday 25, the projections of ashes and smoke receded. However, seismographic data collected by the Karthala Volcano Observatory has shown that the seismic activity is continuing. According to the observatory, a lava lake is in formation in the crater, as of yet confined within the crater. According to the local authorities, approximately 2,000 people fled from their villages in the region of Bambao in the central part of the island, and sought refuge in less exposed areas, such as Mitsamiouli, Mboudé, and Oichili." "Concerns exist regarding the availability of potable water in the areas exposed to smoke and ashes. Preliminary results from the assessment indicate that as many as 118,000 persons living in 75 villages may be affected by the contamination of water tanks. A further assessment of the water tanks is underway to ascertain the exact scope of the needs. Concerns also exist regarding the impact of the pollution by volcanic debris on agriculture and livestock." A 28 November news report by Agence France-Presse (AFP) also noted some of the above details, but added some new points. They said that the eruption had the effect of " . . .killing at least one infant, infiltrating homes, shops and offices and contaminating water in cisterns during the height of the dry season. 'We have two problems with water: one, we are in the dry season and two, the reserves in many private cisterns are now polluted,' minister of state for defense Abdu Madi Mari told AFP." "He said cistern water supplies for about 120,000 residents mainly from rural villages near the volcano had been contaminated by the ash, which has also raised fears of respiratory ailments." "Authorities on Grand Comore, the largest of the three semi-autonomous islands in the Comoros, had appealed for international assistance to help in distributing potable water to those in need, Mari said." The AFP news report stated the eruption sent only "about 500 villagers fleeing from their homes in the shadow of the mountain." and said that despite continued tremor reported by the observatory, "almost all have now returned." In a 9 December report the World Food Program estimated that the 24 November Karthala eruption affected 245,000 people. They briefly mentioned the issue of potentially contaminated drinking water but noted that, although minor eruptions continued, abundant rain in the weeks that followed helped reduce the potential water and air contamination problems. As noted above, no reports were found discussing problems from ash-choked drainages (lahars). Information Contacts: UNOSAT, United Nations Institute for Training and Research (UNITAR), Palais des Nations, CH - 1211 Geneva 10, Switzerland (URL: https://unitar.org/unosat/); Charles Holliday, U.S. Air Force Weather Agency (AFWA)/XOGM, Offutt Air Force Base, NE 68113, USA; Fred Prata, CSIRO Marine and Atmospheric Research, 107-121 Station Street, PMB 1, Aspendale, Victoria 3195, Australia; NASA Earth Observatory, NASA Goddard Space Flight Center, Code 900, Greenbelt, MD 20771, USA (URL: http://earthobservatory.nasa.gov/); MODIS Rapid Response Team, Goddard Space Flight Center, Code 923, Greenbelt, MD 20771, USA; Agence France-Presse (AFP); United Nations, Office for the Coordination of Humanitarian Affairs (OCHA) and the World Food Program (WFP) (URL: https://reliefweb.int/, http://www.wfp.org/). After the 11 July 1991 phreatic eruption, 14 years of quiescence at Karthala was disrupted in 2005 by two strong explosive events. These events, occurring on 16 April 2005 (BGVN 30:04) and 24 November 2005 (BGVN 30:11), resulted in deposits of fine ash scattered over a large part of the island. This report presents some further observations and analyses of the November event by scientists from the Comoros and Reunion. Seismic precursors. The seismicity on figure 16 delineates four periods during 2005: (1) From the beginning of the year until the 16 April explosive event, an interval characterized by significant seismicity. (2) From the 16 April event until just prior to the 25-26 August seismic crisis, an interval with relatively low seismicity (only 102 events recorded in 116 days). (3) An interval from 26 August to 23 November that began during the 25-26 August seismic crisis when 190 events occurred. Moderate seismicity following the seismic crisis ramped up after 27 October until the 24 November eruption. This period was characterized by a total of 1,063 seismic events, an average of 12 earthquakes per day. (4) From the 24 November eruption until the end of the year, an interval of relatively low seismicity similar to the second period. The 24 November earthquake swarm began at 1902, dropped significantly at 1950, and restarted at 2021 with sustained tremor. Figure 16. Cumulative distribution of earthquakes registered at Karthala during the year 2005. Courtesy of KVO. The investigators noted that the seismic crisis of 25-26 August 2005 marked the beginning of the new eruptive cycle. It preceded the November 2005 eruption, but was much more subdued than the build up before the eruptions in April 2005 and July 1991 (BGVN 16:06 and 16:08). Earthquakes were located by KVO using Sismalp (the French Alps Seismic Network). Uniquely, for the November 2005 seismic crisis, the hypocenters were 500-1,000 m shallower than those of April 2005. This could be attributed to shallower magma storage for the last eruption. Activity during 24 November-5 December 2005. The beginning of the 24 November eruption was visible from Moroni (the capital city of the Comoro Islands) with lightning, rumblings, and a large dark plume at the summit. Ash first fell on the E coast of the island around 2300 on 24 November and the tremor intensity significantly dropped. On the W part of the island, ash started to fall on 25 November at 0500 with very strong intensity. Evacuation became very difficult, schools remained closed, and some people used masks to breathe. Ashfall was so intense that the authorities required the inhabitants to remain in their homes. The United Nations Office for the Coordination of Humanitarian Affairs (OCHA) reported that, according to the local authorities, ~ 2,000 people fled from their villages in the region of Bambao in the central part of the island, and sought refuge in less exposed areas, such as Mitsamiouli, Mboudé, and Oichili. At 0700 on 25 November the sky was darkened by ash (figures 17 and 18). Part of the population fled towards the N of the island. It was only around 0900 that the sky partially cleared; however, ash continued to fall with decreasing intensity during the day. Ash deposits covered three-quarters of the island. The international airport located in the N part of the island remained free of ash deposits. The Toulouse Volcanic Ash Advisory Center issued an advisory to limit risks for air traffic; however, the eruption did not halt airport operations. Satellite imagery on 25 November revealed an ash cloud reaching ~ 11.6 km altitude. Figure 17. An ash plume from Karthala at 1000 on 25 November 2005 led to ash-draped surfaces and heavily filtered sunlight in the capital, Moroni (population variously estimated at 20,000-63,000 residents, located 13 km NW of the summit). Ashfall was very heavy until 1200, then decreased throughout the rest of the day. Courtesy of Hamid Soulé, KVO. Figure 18. Downtown Moroni as it appeared at 1000 on 25 November 2005 after the eruption of Karthala. Courtesy of Dominique Meyer-Bisch, Embassy of France in Comoros Islands. During 25 November, about 30 seismic events were recorded by KVO, causing concern about the possibility of a crack or fissure opening on Karthala's flank, as occurred in April 1977 (SEAN 02:03). During the night, red glow at the summit was clearly visible from the coast. On 26 November, a field excursion found a lava lake in the Chahalé crater (figure 19). Prior to the eruption that crater's floor had been covered by a water lake some tens of meters deep. In contrast to the crusted-over lava lake of April 2005 (BGVN 30:04), in November it was almost entirely liquid, with a very large fountain in its center. By 30 November the lava lake had solidified over ~ 80 % of its surface (figure 20). On 5 December it was almost entirely solid, with only two small spatter cones active (figure 21). Figure 19. On 26 November 2005 investigators ascended Karthala and observed a molten-surfaced lava lake inside Chahalé crater. The lake was about 60-80 m in diameter. Many parts of the lake had a molten surface covered by a chilled skin, although some large blocks of cooler material also lay scattered in the lake. This picture was taken looking down from the crater's N edge. Courtesy of Christophe Roche, French school teacher in Moroni. Figure 20. On 30 November 2005 a field excursion allowed investigators to observe the ongoing solidification of the lava lake inside Karthala's Chahalé crater. The only incandescence plainly visible appears in the lake's central area. This picture was taken looking from the crater's NW edge. Courtesy of François Sauvestre, KVO. Figure 21. A Karthala excursion on 5 December 2005 allowed scientists to observe an almost entirely solidified lava lake. Two small (5-m high) spatter cones had developed over the area previously hosting the most intense incandescence, and some small zones adjacent to them still remained incandescent. The cones stopped being active on 8 December. This picture was taken looking from the NW edge of the crater. Courtesy of François Martel-Asselin. Eruptive products. The landscape at the summit illustrated the style and intensity of the eruption. Measurements of ash deposit thickness were difficult to make. Along the coast ash deposits were between a few millimeters and a few tens of millimeters thick. On the W side of the caldera, ~ 1.5 km from the crater, 70 cm of ash deposits were measured at the same location where 40 cm of ash had fallen in April 2005, an increase of 30 cm in thickness. Closer to the crater, the thicknesses were not measured because they were greater than 1.5 m.
Field work revealed that on the edge of the caldera, ballistic blocks had fallen from the phreatomagmatic phase at the beginning of the eruption. Closer to the central crater the density of volcanic debris increased strongly. In an area covered by several tens of centimeters of ash, blocks impacted the ground leaving an amazing number of craters on the surface (figure 22). Distinctive tephra deposits, presumably related to lava fountains were identifiable everywhere around the central crater (figure 23). These juvenile deposits spread 500 m N from the central crater, whereas they extended only 100 m or less to the S. Products of this magmatic phase were clearly erupted or carried by wind to the N, and they must have ascended higher than 300 m, the depth of the Chahalé pit crater. On 8 December 2005 at about 1000 (15 days after the eruption), both seismic and explosive activity stopped. Figure 22. Bomb impact craters on the N and E sides of Karthala's summit convey a surprising intensity of ballistic bombardment. This picture was taken from the summit (E side of Chahalé crater) looking to the N. Courtesy of Philippe Crozet. Figure 23. An area around Karthala's summit was covered by tephra deposits. 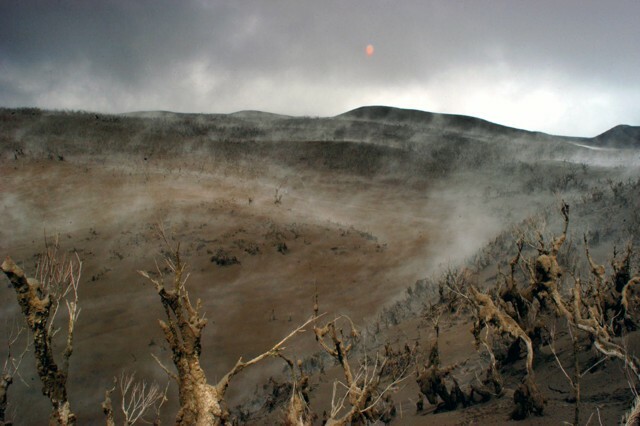 The approximately 2-m high vegetation that remained after the eruption of April 2005 was reduced to about 1-m high in this later, though undated, photo. A 1-m-thick layer of tephra was measured 700 m from the eruptive center. This picture was taken on the W part of the caldera looking NW. Courtesy of François Martel-Asselin. Human impact. This eruption was more explosive and longer than the two preceding eruptions in spite of weaker seismicity, and a significant quantity of ash fell in water cisterns. According to OCHA, there were about 118,000 people living in 75 villages that were affected by the cistern contamination. Wind continued to raise large quantities of ash that again fell on the dwellings and into cisterns. In contrast to the April 2005 eruption, no coastal residents reported smelling sulfurous odors. After the end of the eruption, few long period earthquakes were recorded. Information Contacts: Nicolas Villeneuve, Centre de Recherches d'études Géographiques de l'Université de La Réunion (CREGUR), Université de La Réunion, BP 7151, 15 Avenue, René Cassin, 97715 Saint-Denis, Réunion, France; Anthony Finizola and Patrick Bachèlery, Laboratoire des Sciences de la Terre de l'Universite de la Reunion (LSTUR), Université de La Réunion, BP 7151, 15 Avenue, René Cassin, 97715 Saint-Denis, Réunion, France; Francois Sauvestre and Hamid Soulé, Centre National de Documentation et de Recherche Scientifique (CNDRS), Place France, BP 169, Moroni, République Fédérale Islamique des Comores (URL: http://volcano.ipgp.jussieu.fr/karthala/stationkar.html); Karthala Volcano Observatory (KVO), Centre National de Documentation et de la Recherche Scientifique des Comores, BP 169, Moroni, République Fédérale Islamique des Comores. Karthala generated two strong eruptions in 2005 (BGVN 31:01). This report, based on information from Kashkazi (a newspaper in the Comores), discusses the interval May to late July 2006.Kashkazi reported that a magmatic eruption on 28 May occurred inside the Chahalé caldera. Lava fountains were seen inside the lava lake. No lava flow was observed outside the caldera. Some bubbling continued in the crater lake through 31 May (figure 24), but the surface on the SE part had solidified. Figure 24. The lava lake in Karthala's Chahalé caldera, 31 May 2006. The lava lake's surface contained both a churning zone of degassing lava (right center) and a larger adjacent zone largely composed of cooled floating crust. Photo by Julie Morin. The news media reported several other events that occurred by the afternoon of 1 June. The lava lake had completely crusted over. Seismicity had returned to background levels. Some gas and ash was released. According to available sources, the volcano was relatively quiet until a brief 16-18 July eruption. In that eruption a lava lake again formed in the crater and ash was discharged. A UN official stated in an IRINnew.org article, ". . . contamination of the water supply raises serious concerns about the availability of potable water in the areas exposed to smoke and ash." As of 22 July, about 2,000 people had evacuated and 123,000 people lacked clean water supplies. Information Contacts: IRINnews.org, United Nations, Office for the Coordination of Humanitarian Affairs (URL: http://www.irinnews.org/); Kashkazi. On 28 May 2006, a magmatic eruption occurred inside the Chahalé caldera of Karthala volcano. Information in the previous report (BGVN 31:06) was based on newspaper accounts. This report comes from Hamidou Nassor, Julie Morin, Christopher Gomez, Magali Smietana, François Sauvestre, and Christopher Gomez. They noted some key references relating to Karthala, including a 2001 dissertation (Bachèlery and others, 1995; Krafft, 1982; and Nassor, 2001). The 28 May 2006 crisis began with a few hours of elevated seismic activity, beginning around 1230 (local time). Three hours later, seismic stations recorded a small crisis that lasted for 6 hours and produced both SP and LP signals. Around 2107 the magmatic eruption began. Seismographs recorded a tremor only a few seconds later. From the coast of the island a red cloud was visible above the volcano. Scientists at the Karthala observatory met with government representatives and confirmed a magmatic eruption. It was not yet known if the eruption had occurred on the caldera floor or inside the main crater. A trip to the volcano was necessary in order to assess the volcanic activity and determine the exact location of the eruption. Two hypotheses were proposed: (1) If the eruption was located in the N part of the caldera, the lava could flow outside the caldera, towards populated areas; (2) If the eruption was located inside the main crater, to the S, lava would remain inside the crater. The Comorian authorities helped the scientific team to get assistance from the South African Army (AMISEC) to fly over the volcano. On the morning of 29 May 2006, the scientific team and AMISEC personnel flew over the volcano. 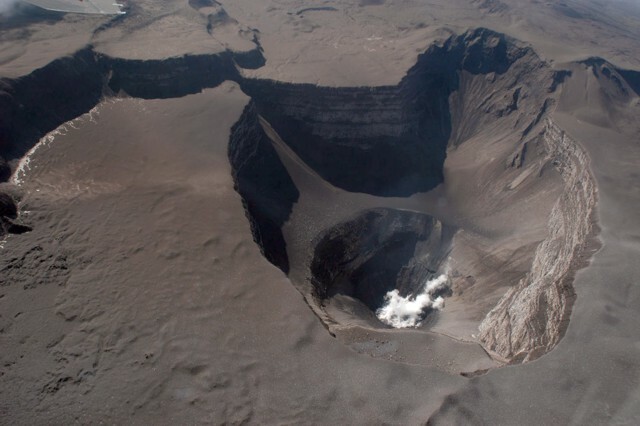 They saw that the eruption was contained inside the main (Chahalé) crater, where the past three eruptions had occurred. A lava fountain was observed in the middle of the lava lake (figure 25). No lava flow was observed outside the caldera. Seismic records showed a tremor caused by the lava fountain; the fountain was apparently spurting since the beginning of the eruption. Figure 25. This lava lake was seen in the main crater, Chahalé, on 29 May. The lava fountain was in the N part of the lake. Some lava blocks larger than 1 m in diameter are visible. The gas and vapor plume reached an altitude of about 3 km. Photo courtesy of Julie Morin. On the morning of 31 May, the scientific team returned to Karthala with AMISEC forces. Part of the lake was still mobile and bubbling, but part had solidified on the surface in the SE and a few blocks were floating on the side of the lake (figure 26). No projectiles overshot the caldera rim. Figure 26. Karthala's lava lake on 31 May. In the lake's NW, a lava fountain was active, while the lake's S part had started to solidify. Photo courtesy of Magali Smietana. On 1 June 2006 seismic monitoring indicated the end of the tremor phase. On 2 June scientists returned to the summit with AMISEC forces. They observed that the surface of the lava lake was solidified, but the deeper portions of the lake remained hot (figure 27). Figure 27. The floor of Karthala's Chahalé crater remained filled by lava on 2 June, although a crust had formed covering much of the lava lake. Photo courtesy of Christopher Gomez. References. Bachèlery, P., Damir, B.A., Desgrolard, F., Toutain, J.P, Coudray, J.P., Cheminée, J-L., Delmond, J.C., and Klein, J.L. 1995, L'éruption phréatique du Karthala (Grande Comore) en juillet 1991: C.R Acad. Sci. Paris, 320, série Iia, p. 691-698. Krafft, M., 1982, L'éruption volcanique du Karthala en avril 1977 (Grande Comore, Océan Indien): C.R. Acad. Sci. Paris, t 294, série II, p. 753-758. Nassor, H., 2001, Contribution ? l'étude du risque volcanique sur les grands volcans boucliers basaltiques: le Karthala et le Piton de la Fournaise: Ph.D. thesis, Univ. Reunion. Information Contacts: Hamidou Nassor (LSTUR) Université de la Réunion BP 7151, 15 Avenue, René Cassin, 97715 Saint-Denis; Julie Morin; Christopher Gomez, Laboratoire de géographie physique CNRS LGP; Magali Smietana, Universite de Rennes 1, France; Francois Sauvestre (CNDRS), BP 169, Moroni (URL: http://volcano.ipgp.jussieu.fr/karthala/stationkar.html). Karthala, in the Comoros Islands (figure 28), was a scene of elevated seismicity from October 2006 to January 2007. The last time an eruption of Karthala caused significant damage was in the 1970s when it destroyed a village S of the capital, Moroni. Presently, Karthala is monitored using seismic and ground deformation surveys. The seismic activity that began 28 May 2006 (BGVN 31:07) appeared to have been a singular event. Renewed seismicity on 29 October 2006 prompted authorities to warn island residents that one of the two volcanoes on the main island of Grand Comore (Karthala or La Grille) could erupt within the next few weeks. Figure 28. Map illustrating the regional setting of Karthala volcano in the Comoros Islands with comments relevant to the January 2007 crisis. Courtesy of ReliefWeb, a part of the United Nations Office for the Coordination of Humanitarian Affairs - Integrated Regional Information Networks (IRIN). Following earthquakes (which measured M 4 and larger on the Richter scale) that occurred on 12 January 2007, authorities again alerted the local population about hazards due to Karthala and activated a National Emergency Preparedness Plan. According to news reports, Hamidi Soule Saadi, director of the Karthala Volcano Observatory (KVO), warned that magma and gas were trapped inside the mountain. According to a 15 January news article obtained from the ReliefWeb News, scientists from the KVO reported that an eruption occurred during the evening of 12 January. The news article noted Moroni residents observing jets of red flames above the summit (on the night of 12-13 January). A low eruptive tremor was detected 13 January and was accompanied by a number of M 4 earthquakes. An ash plume was observed above the volcano. Aerial observers on 15 January saw a lava lake forming within the crater. The KVO said there was no immediate risk of a lava flow, and that there were three scenarios to consider: (1) seismic activity could decrease, reflecting diminished volcanic activity; (2) cracks or fissures could occur on the flanks, resulting in lava flowing down the side of the mountain; or (3) seismicity could intensify and increase lava production, which could flow over the crater rim. On 18 January, the volcano shook twice more but the tremors seemed to be weakening. No evacuations of the island's 300,000 people occurred during the elevated seismicity; however, frightened residents were sleeping outside on football fields and in their gardens, fearing collapse of their homes. UN Resident Coordinator in the Comoros, Giuseppina Mazza, later reported that "There are now fewer earthquakes and their intensity has reduced, the population is not panicking." 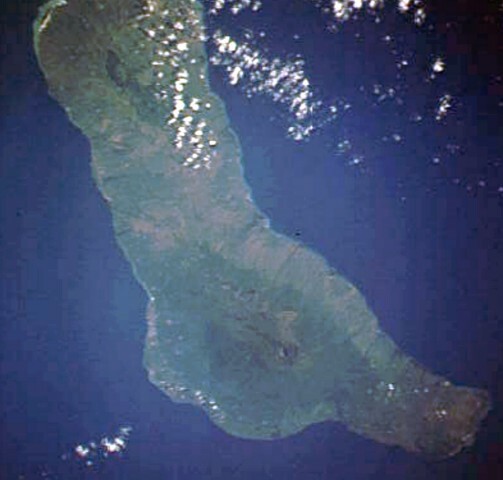 The IRIN news article noted that volcanic activity is common to Grande Comoro Island. Karthala erupted twice in 2005, affecting 40,000 people in April and 175,000 more in November. After an eruption on 28 May 2006 (BGVN 32:07), volcanic dust and debris covered large areas of the island. Volcanic ash contaminated water supplies, raising concerns about the health of people and livestock, along with its effects on agriculture. According to the UN Office for the Coordination of Humanitarian Affairs (OCHA), since the 12 January volcanic activity, the authorities kept the hazard status at "red alert" and "have activated the national emergency response preparedness plan. They established a crisis management cell (CMC) which includes government departments, UN agencies, the Comoros Red Crescent Society, as well as local NGOs and diplomatic missions ... [and the] partners are reviewing preparedness arrangements." Information Contacts: Hamidi Soule Saadi, Karthala Volcano Observatory (KVO), Observatoire Volcanologique du Karthala, Centre National de Documentation et de la Recherche Scientifique des Comores, BP 169 Moroni, République Fédérale Islamique des Comores; Giuseppina Mazza, UN Resident Coordinator in Comoros, BP 648, Moroni, Comoros; Hamidou Nassor, Université de la Réunion, BP 7151, 15 Avenue, René Cassin, 97715 Saint-Denis, La Réunion, France; United Nations Office for the Coordination of Humanitarian Affairs?Integrated Regional Information Networks (IRIN), 3rd Floor, Sandton 2146, PO Box 1617, Parklands, 2121, Johannesburg, Republic of South Africa; Reuters. The southernmost and largest of the two shield volcanoes forming Grand Comore Island (also known as Ngazidja Island), Karthala contains a 3 x 4 km summit caldera generated by repeated collapse. Elongated rift zones extend to the NNW and SE from the summit of the Hawaiian-style basaltic shield, which has an asymmetrical profile that is steeper to the S. The lower SE rift zone forms the Massif du Badjini, a peninsula at the SE tip of the island. Historical eruptions have modified the morphology of the compound, irregular summit caldera. More than twenty eruptions have been recorded since the 19th century from the summit caldera and vents on the N and S flanks. Many lava flows have reached the sea on both sides of the island. An 1860 lava flow from the summit caldera traveled ~13 km to the NW, reaching the W coast to the N of the capital city of Moroni. Esson J, Flower M F J, Strong D F, Upton B G J, Wadsworth W J, 1970. Geology of the Comores Archipelago. Geol Mag, 107: 549-557. Krafft M, 1982. L'eruption volcanique du Kartala en Avril 1977 (Grande Comore, Ocean Indien). CR Acad Sci Paris, Ser-II, 294: 753-758. Krafft M, 1983. Guide des volcans de la Grande Comore. Unpublished manuscript, 101 p.
Savin C, Grasso J-R, Bachelery P, 2005. Seismic signature of a phreatic explosion: hydrofracturing damage at Karthala volcano, Grand Comore Island, Indian Ocean. Bull Volcanol, 67: 717-731. Spath A, Le Roex A P, Duncan R A, 1996. The geochemistry of lavas from the Comores Archipelago, western Indian Ocean: petrogenesis and mantle source region characteristics. J Petr, 97: 961-991. Strong D F, Jacquot C, 1970. 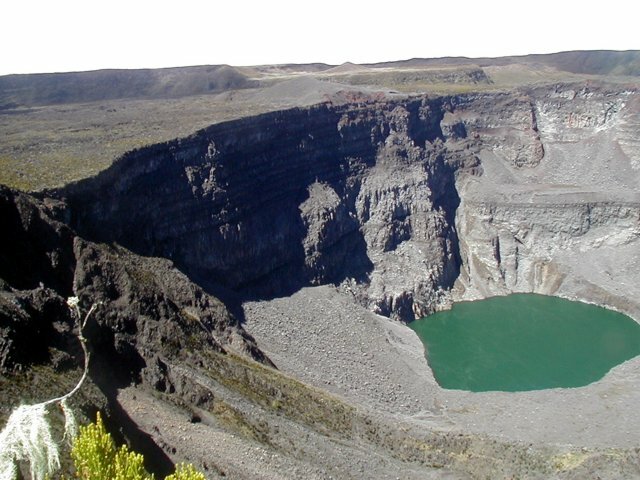 The Karthala caldera, Grande Comore. Bull Volcanol, 34: 663-680. Volcanological Society of Japan, 1960-96. Bull Volc Eruptions, no 1-33. [Annual reports issued 1 to 3 years after event year, published since 1986 in Bull Volcanol]. 1833 Unknown Confirmed Historical Observations Summit caldera ? Remarks: The January 2007 eruption of Karthala was associated with 25 cm of deformation near the summit and is characteristic of a dyke intrusion. Reference List: Owens et al. 2014*. Owens, C., J. Biggs, and A. Rust,, 2014. Deformation at lava lake volcanoes: the 2005-7 eruptions at Karhala volcano, Comoros. Fall AGU Meeting. Grand Comore Island in the Indian Ocean NW of Madagascar is formed by two massive shield volcanoes. The more well-known and historically active Karthala volcano at the southern end of the island has a 3 x 4 km summit caldera. Elongated rift zones extend to the NNW and SE; the lower SE rift zone forms the Massif du Badjini, a peninsula at the SE tip of the island (bottom right). The Holocene La Grille volcano forms the northern part of the island. Youthful lava flows from both volcanoes have reached the coast. NASA Space Shuttle image STS009-39-2516, 1983 (http://eol.jsc.nasa.gov/). Cloud banks drape the flanks of the massive Karthala shield volcano at the southern end of Grand Comore Island. A pyroclastic cone of La Grille, another massive shield volcano that forms the northern part of the island, lies along the coast in the foreground. Karthala contains a 3 x 4 km summit caldera, and elongated rift zones extend to the NNW and SE from the summit of the Hawaiian-style shield. More than twenty eruptions have been recorded at Karthala since the 19th century, but no historical eruptions are known from La Grille volcano. Copyrighted photo by Steve and Donna O'Meara, 2002. The greenish ~ 300-m-diameter Chahalé crater in the summit caldera complex of Karthala volcano is seen here in August 2003, more than a year prior an eruption in April 2005. The photo, taken by an automatic camera located at the summit, looks from the NNE towards the SSW. Karthala is the southernmost and largest of the two shield volcanoes forming Grand Comore Island (also known as Ngazidja Island) and contains a 3 x 4 km summit caldera generated by repeated collapse. and elongated rift zones extending to the NNW and SE. Photo by Nicolas Villenueve, 2003 (Université de la Réunion). A phreatic eruption plume is seen from Karthala's eastern slopes on the afternoon of April 17, 2005. The vent lies below the white-colored zone in the center-right portion of the photo. With enlargement, many parts of the image record the descent of large pieces of ejecta. A brief explosive eruption beginning on April 16 deposited ashfall that increased in intensity the following day. On the 18th a lava lake was seen in the crater; its surface was cooled by the following day. Photo by Daniel Hoffschir, 2005. On April 18, 2005 a lava lake formed in the Chahalé crater, previously occupied by a greenish-colored crater lake. In this aerial photo, taken from the north on the morning of the 18th, considerable portions of the lava lake's surface still remained molten and incandescent. The lake's surface only remained molten only for a few hours, and by the next day its chilled surface emitted only steam clouds. Photo by Hamid Soulé, 2005 (Karthala Volcano Observatory). This April 19, 2005 aerial photograph of Karthala was taken from the SE centered on Chahalé crater. The surface of the lava lake, which had been emplaced the day before, had chilled and it emitted white vapor. Much of the summit area displays the recently deposited smooth-surfaced tephra blanket from explosive eruptions on the 16th and 17th. Photo by Nicolas Villenueve, 2005 (Université de la Réunion). Tephra deposits left by Karthala's April 16-18, 2005 eruption altered the landscape and destroyed vegetation. This picture was taken at the entrance to the first caldera on the western trail, viewed looking to the south. A brief eruption from Chahalé crater beginnning on the 16th deposited ashfall that increased in intensity the following day, when a mushroom-shaped cloud was accompanied by lightning. Ash deposits varied in thickness from a few millimeters on the coast to ~1.5 m at the summit. Karthala is seen in two images (both with 10-m resolution) at nearly the same scales. The image at left was obtained before the 2005 eruptions; taken by SPOT4 on July 13, 2004. The image at right is from after the November 24, 2005 eruption; taken by SPOT5 on December 5, 2005. Both images are partly masked by weather clouds. The right-hand photo shows ashfall deposits from the April and November eruptions blanketing the summit caldera complex and upper flanks. An image of the Karthala November 25, 2005 ash plume was obtained from NASA Terra MODIS. The image was centered over the Comoros islands, with the islands Mayotte, Anjouan, and Moheli labeled. Grand Comore lies under ash clouds, but the location of Karthala is indicated. For scale, the distance from Karthala to the south end of Mayotte island is ~240 km. The image shows Air Force Weather Agency interpretations of the ash cloud extent. Image courtesy of Charles Holliday (U S Air Force Weather Agency). An explosive eruption November 24-25, 2005 deposited ash over the SE and SW parts of Grand Comore Island in the Indian Ocean. Ash fell in Moroni, the capital city of the Comoros, located on the west-central coast of Grand Comore (also known as Ngazidja Island). On the 26th of November, this incandescent lava lake was observed inside Chahalé crater within the summit caldera of Karthala volcano. Within a few days the surface of the 60-80-m-wide lava lake had mostly solidified, and the eruption ended on December 8. Photo by Christophe Roche, 2005. Large Eruptions of Karthala Information about large Quaternary eruptions (VEI >= 4) is cataloged in the Large Magnitude Explosive Volcanic Eruptions (LaMEVE) database of the Volcano Global Risk Identification and Analysis Project (VOGRIPA).